Papa Mali's latest album documents his pre-Katrina New Orleans summit meeting with some of the city's most celebrated players (Henry Butler, Kirk Joseph, and Big Chief Monk Boudreaux) brought together with one request: Do your thing! More of a seance than a recording session, spirits weave through the air like curls of smoke, conjuring visions of snake handlers and tent revivals, spy boys and street parades, proceeding with a broke-leg swagger to a place that's less about being funky and more about being Southern. Other guests: Golden Eagles Mardi Gras Indians, Victoria Williams, Chuck Prophet & JJ Grey (of Mofro). This enhanced CD also contains feature-length documentary video. Featuring some of the baddest musicians from the Austin music scene, Papa Mali & The Instagators bring a mix of southern fried soul, blunted Delta blues, New Orleans funk, and tribal hoodoo rhythms. Bandleader MALCOLM WELBOURNE's personification "PAPA MALI" is a salute to his home territory of north Louisiana. Malcolm was born in Mississippi and raised in Shreveport, where absorbing the blues along Bayou Pierre was just as much a matter of course as chasing the mosquito fogging truck with friends -- and equally intoxicating. He spent his summers with grandparents in New Orleans digging that city's rhythm (and blues) and after hearing the Wild Tchoupitoulas and the Meters on the streets of New Orleans at age eleven, he developed an early and ongoing attachment to Crescent City funk. It was Burning Spear's band that gave Malcolm the nickname "Papa Mali" years ago while touring with Spear and the Killer Bees. With one critically aclaimed CD "Thunder Chicken" (produced by Dan Prothero and released on San Francisco boutique label, Fog City Records - the same team that introduced the world to Galactic, Mofro and Greyboy Allstars keyboard wiz, Robert Walters) and another Prothero produced Swampland release in the works, Papa Mali is positioned to make an impact in 2004 and beyond. Although Papa Mali is essentially a solo artist, slide guitarist, singer/songwriter and acclaimed producer , he is usually seen in the company of some of the funkiest and greasiest musicians on the planet. Recent collaborations include Cyril Neville (Neville Bros) , Big Chief Monk Boudereaux of the Golden Eagles, Anders Osborne, Omar Dykes(of Howlers fame), Jesse Mae Hemphill, Lavelle White, Ruthie Foster, Kevin Russell(Gourds) and too many more to name. 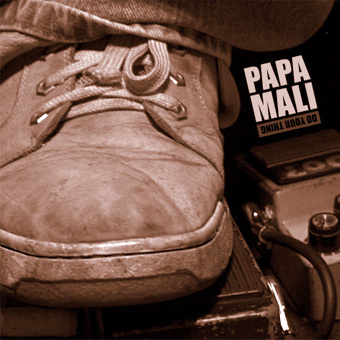 Papa Mali has completed his 2nd album which is currently being mixed and mastered by Dan Prothero in Californ-ia. The album is due out this fall, and will no doubtedly be suppored by a coast to coast tour. Look for Papa Mali to bring his "up to your ears in swamp-funk" style of music to a town, city, or back porch near you sometime very soon.